Mimosa Digital offers full-service black-and-white and color printing on transparencies & clear glossy labels with quick turn-around. Choose from standard 8.5x11 or 11x17 sizes, or go BIG with our large format transparencies printed up to 44x72. 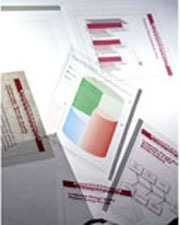 NEW: Print transparencies & clear labels with WHITE INK. Transparencies and clear gloss labels look amazing when a white ink underlay is applied under color so that the image pops. Transparencies are often used to overlay other printed images or graphics to showcase different options in a real estate environment e.g. furniture or pool options. Mimosa Digital uses the latest software and equipment so that your transparencies look clean and clear, and your presentation materials make you look your best. *note that setting up files for white ink printing is best done in professional graphic software like Adobe Illustrator. May not work as intended for files created in word processors, vector image programs (like Photoshop) or other consumer or business programs. We recommend ordering a sample print before ordering your full run to ensure your file is prepared correctly. Click here to download a file prep guide for more complex design work. Note that our default printer setup option is "Data Portion Excluding White" which will print white ink under any color elements in the file, but will NOT print any specified white elements. If you want to print with any other printer settings you MUST place your order and CALL us immediately with specific print instructions (do not email only - emails may not be read by the production team before printing).